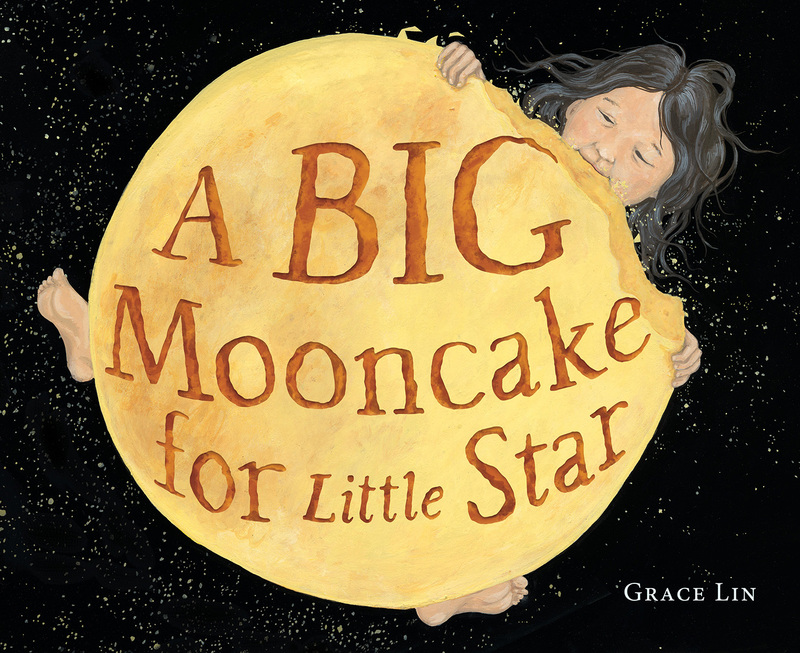 Author/illustrator Grace Lin (Where The Mountain Meets The Moon, Ling And Ting) joins us to premiere the cover of her first new picture book in eight years, A Big Mooncake for Little Star! Watch the video below, then keep reading to learn more about the inspiration behind the story. A BIG MOONCAKE FOR LITTLE STAR is an original story, but it feels timeless. What inspired you to create this beautiful book? Grace: Thank you! I’m so glad you liked the book. There are many inspirations for this book, but the one that began it was when my daughter was three and we celebrated the Moon Festival for the first time. The Moon Festival is an important Asian holiday—kind of like Thanksgiving here in the US—but the way you celebrate it is by eating mooncakes and telling stories about the moon. While she waited, Hazel discovered the joy of mooncakes and quickly ate all the ones we had. But when she discovered that she had eaten them all and would be no more until next year, she was devastated—drama as only a three-year-old can manufacture! To comfort her, I showed her photos of mooncakes online. There, we discovered many different types of mooncakes—some were flat and some were pale and some, Hazel said, “were just like the real moon!” And when she said that a seed of an idea just kind of popped into my head. That idea bloomed into this book. This book has no roots in Chinese mythology, but in it I tried to capture all the beauty, quiet joy and love that is part of the Moon Festival. What materials did you use to create your illustrations? Grace: I’m still very old school! I’m not digitally savvy at all. I use watercolor paper, paintbrushes and gouache (an opaque watercolor paint). Reading A BIG MOONCAKE FOR LITTLE STAR is like escaping into a dream. How did you use the unique format of a picture book to help achieve this? Grace: What’s lovely about the picture book format is that you can tell two stories—one with the words and one with the pictures. This is a story that could only be told with picture book—we read the story of Little Star sneaking bites of the mooncake—but we see how her bites make the cake into the phases of the moon and the crumbs become stars. Without the picture book format to tell and slowly reveal both stories, the book would lose all wonder and artistry. Do you have a favorite spread, and if so, why is it your favorite? Grace: I particularly like the endpapers. The book is also a small homage to my favorite Robert McCloskey book, Blueberries for Sal: not only is the entire scene a reference to that book’s endpapers, but my endpaper image has hidden references to Blueberries for Sal, as well as many stars/constellations. I’m hoping readers pick up on them and get a little thrill. Grace: This book is a love letter to my daughter, a book that I made so that she will always know how much I love her. I hope when people read it, they share it with a child they love too. Thanks for sharing A Big Mooncake for Little Star with us! A Big Mooncake for Little Star will be on sale from Little, Brown beginning August 28, 2018. 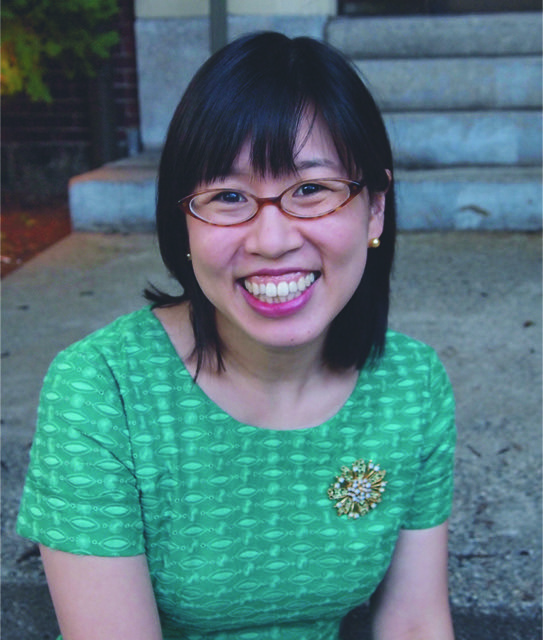 Before Grace Lin was an award-winning and NY Times bestselling author/illustrator of picture books, early readers and middle grade novels, she was the only Asian girl (except for her sisters) going to her elementary school in Upstate NY. That experience, good and bad, has influenced her books—including her Newbery Honor WHERE THE MOUNTAIN MEETS THE MOON, her Geisel Honor LING & TING, and her National Book Finalist WHEN THE SEA TURNED TO SILVER. But, it also causes Grace to persevere for diversity as a New England Public Radio commentator and when she gave her TEDx talk “The Windows and Mirrors of Your Child’s Bookshelf,” as well as her PBSNewHour video essay “What to do when you realize classic books from your childhood are racist?.” In 2016, Grace’s art was displayed at the White House and Grace, herself, was recognized by President Obama’s office as a Champion of Change for Asian American and Pacific Islander Art and Storytelling.